Lemon cheesecake is a classic of kitchens around the world, loved for its light melting texture and lemony flavor. 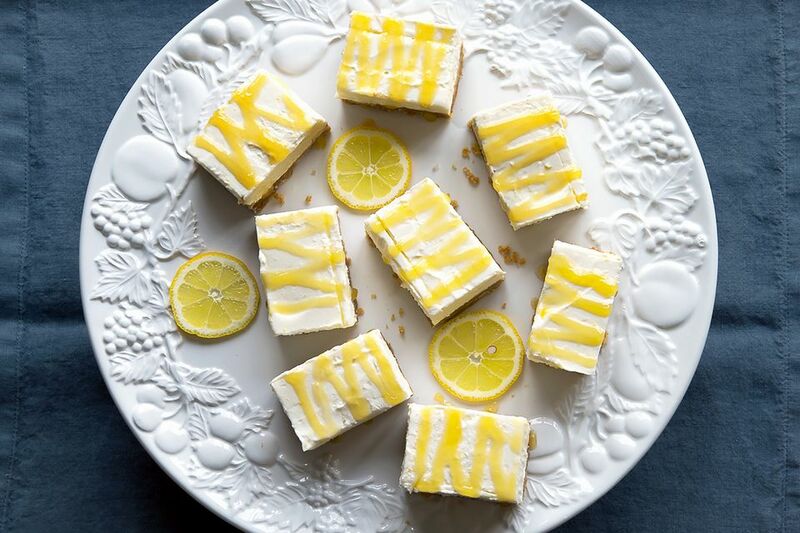 If you thought it could not get better, then take a look at this easy lemon and ricotta cheesecake bar recipe. The cheesecake becomes even lighter if you can believe that is possible, with the addition of creamy ricotta cheese alongside the creamed cheese. The no-bake cake is then chilled down, sliced and then coated in luscious, silky lemon curd for even more of a lemon hit. Want to make this ahead of time? No problem. Merely freeze before decorating and thaw when you are ready to serve, and away you go. How good is that? Lightly grease a 9-inch square loose-bottomed baking tin. Melt the butter in a small saucepan and stir in the sugar. Then add the cracker crumbs and stir to combine all the ingredients thoroughly. Press the mixture firmly into the base of the tin, using a glass or even the heel of your hand. In a stand mixer, or with a hand whisk, beat the cream cheese into the ricotta until smooth. Add the honey or agave, the lemon zest, and vanilla and stir well. Take care not to over beat the mixture or it will be too airy and may collapse. Spread over the cheesecake base and chill for a minimum of two hours, preferably overnight, until firm. Remove the cheesecake from the tin onto a chopping board. Take a sharp knife and briefly dip into hot water, then cut the cheesecake into even-sized bars. Put the warm lemon curd into a piping bag and drizzle over the bars. Serve with slices of fresh lemon or grated lemon rind for decoration. The lemon bars will keep for two to three days in an airtight box in the refrigerator. Do not drizzle with the lemon curd until you are ready to serve them or the curd will melt into the bar; they will still taste amazing, but not look as pretty. The bars can also be frozen, again without the curd decoration. Defrost slowly in the refrigerator before serving. The lemon with the cheese is a classic combination, but that does not mean you cannot experiment with other combos. Replace the lemon with lime and decorate with grated coconut for a genuinely tropical taste. Drizzle the bars with melted chocolate or, for a more unusual combination, leave out the lemon and try a drizzle of caramel sauce and a few flakes of sea salt.